Fox is poised to take an even bigger slice of the ratings pie with "The X Factor." (CNN) -- With shows such as "American Idol" and "Glee," network executives at Fox appear to be tapping into the types of programming that television audiences want. Rival network NBC, not so much. "NBC, with its experiment with Jay Leno, tried to shift the public's taste, which is why it didn't work," said Craig Detweiler, director of the Center for Entertainment, Media and Culture at Pepperdine University. "They tried to say, 'No, really, you want late-night TV earlier.' Whereas Fox seems to be saying, 'Boy, people can't get enough of this, so how do we give them more?' "
Within days of each other, NBC announced that it would be canceling Jay Leno's prime-time show and returning the comic to his late-night gig, while Simon Cowell revealed that he would be leaving "American Idol" to bring his hit British show "The X Factor" to Fox. The latter network dominates the ratings with "Idol," which -- even as it has lost some viewers over the years -- has continued to outpace other shows by drawing tens of millions every week. It begins its ninth season Tuesday. Television critic Ed Bark said Fox is taking the risk of flooding the market with too many singing and talent search-oriented shows. Yet it is a gamble that could pay off big. "If you are going to have 'The X Factor' in the fall followed by 'American Idol' in January, if 'The X Factor' in fact works, it puts Fox in a much stronger position on the fall than they have traditionally been," said Bark, who runs the site Uncle Barky's Bytes. "It could really take off, and in addition to having the World Series and the Super Bowl next season, this could be a mega-year for them." Detweiler said Fox has proved to be more nimble in recent years in its programming than NBC Universal. Fox, considered the upstart fourth network for years after its founding in the 1980s, has homed in on the "social media aspect" of television, with shows like "Idol" and "X Factor" in which viewers vote on contestants, Detweiler said. "Fox has figured out how to give people a voice," he said. "To bring the audience in, and really that's the 21st-century move for TV. Instead of coming at people, it's inviting people into the process." 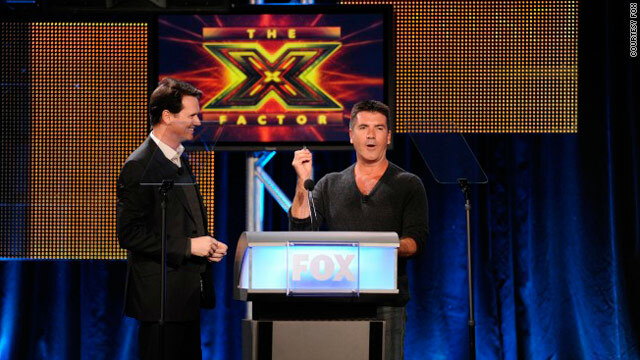 Bill Gorman, editor and co-founder of the site TV by the Numbers, said it remains to be seen whether Fox can deftly manage the shifting of Simon Cowell from its biggest hit show to a newcomer.
" 'American Idol' is the non-sports show that makes Fox what it is," Gorman said. "If they are able to manage the transition of Simon Cowell and 'X Factor' becomes a hit, then it will be genius." iReport: What shows are you crazy about? Meanwhile, NBC continues to struggle to sort out the Leno debacle. Baltimore Sun TV critic David Zurawik said he believes that the stress of being for sale worked against NBC Universal, which was recently acquired by cable giant Comcast. And Zurawik said network head Jeff Zucker may have been ahead of the times with some of his planning. "For the last year or 18 months, he's been talking this future talk in saying, 'Look, we're not a network anymore, we're a cable company, and networks don't make money, cable makes money,' " Zurawik said. "He's right in that cable makes money and in the future, networks probably will be run like cable companies," the critic said. "But the mistake that NBC made under his leadership was moving too quickly into that future and disregarding 50 to 60 years of viewing habits and the old network model of taking care of your affiliates." The Jay Leno switch was a microcosm of this error, Zurawik said. NBC's competition, such as CBS, spent money on more dramas with stars such as Julianna Margulies ("The Good Wife"), strengthening the overall bottom line. NBC, on the other hand, presented itself as a bargain bin. "NBC all but announced it was cheap programming, and who's going to watch cheap programming?" Zurawik asked. "Tell me you are giving me a lousy piece of meat, and am I going to eat it? No."